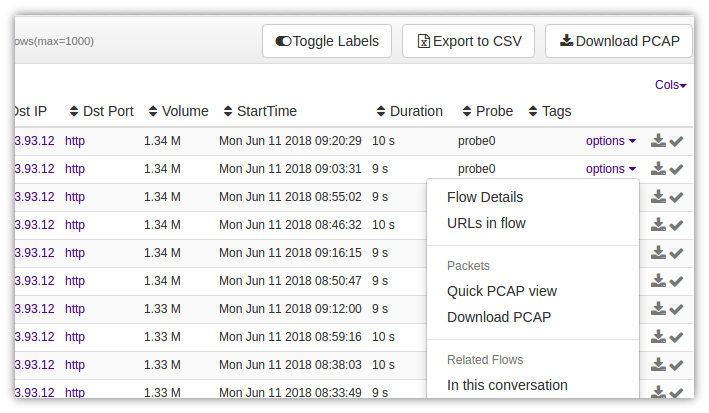 As Trisul meters network traffic, it continuously saves raw packets for future analysis.The ability to call upon raw packets, or full content, is key to the practice of Network Security Monitoring. Raw packets is not just useful for security applications but also for network performance troubleshooting. For example, you can pull up ARP/Spanning Tree packets which can help you nail a layer 2 issue.Packet Capture Basics describes the design of in greater detail. IDS Alerts You want to see the packet that caused a shellcode snort alert. You also want to see nearby packets to the one that caused the alert. Trisul Remote Protocol allows you to write simple scripts in Ruby to automate complex and repetitive tasks.